Are you obliged to anyone? Don't you know how to say thank you? 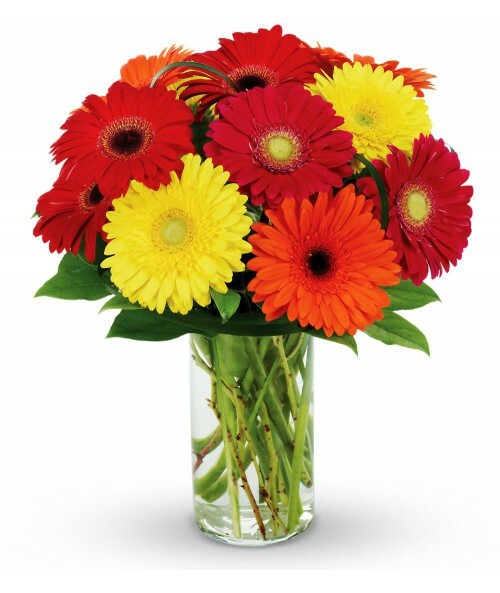 Send some beautiful flowers. Thank you There are 44 products. 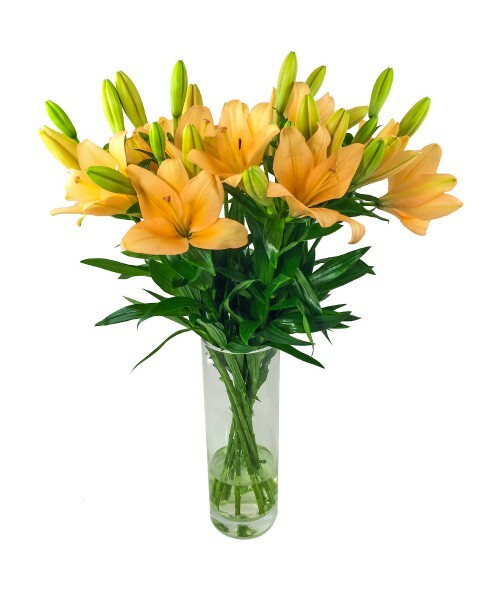 Available colours of lilies are white, yellow, orange, red or pink. 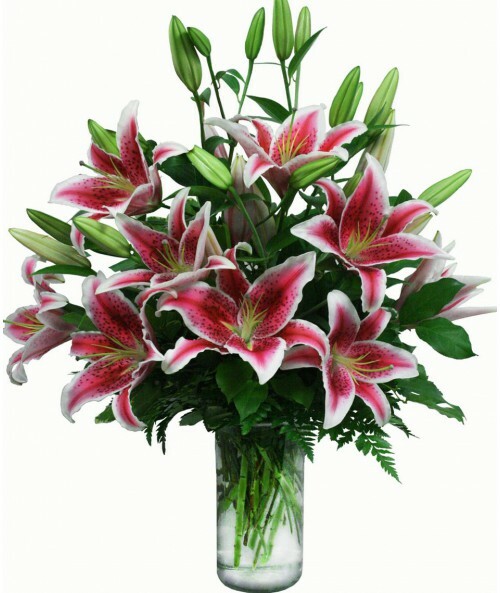 Asiatic lilies in quality SUPER. Even for not much money, you can make someone happy. 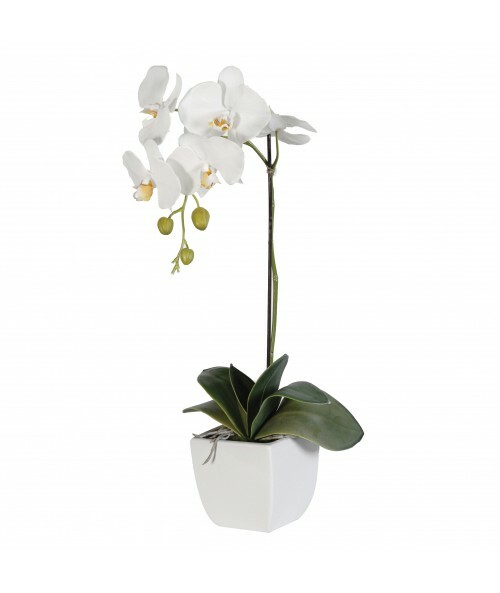 We recommend you to add also some greenery. 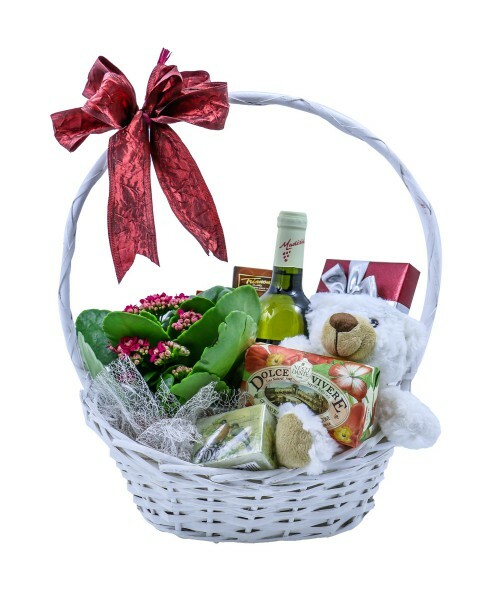 It contains a teddy bear, wine, sweets, soap, scented candle and plants. Aren´t you sure what will your beloved like ? So, this is the best choice. 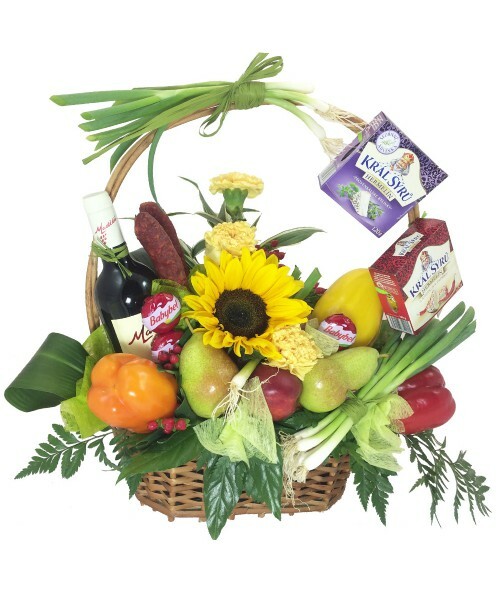 You will certainly lift their mood with this basket full of surprise. Passion and tender belongs to love. 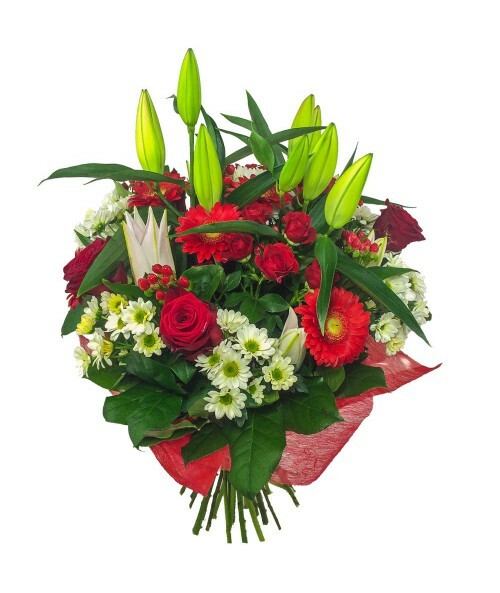 Send red passion and white tenderness to your beloved.. It does not matter if it is your partner or a member of family. 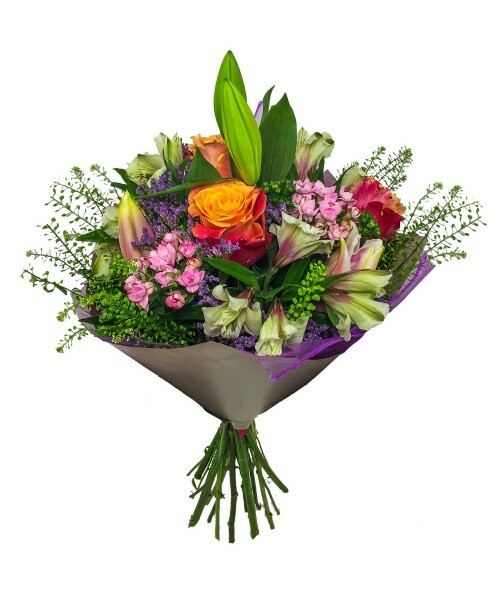 Flower send from love, will certainly make them happy. 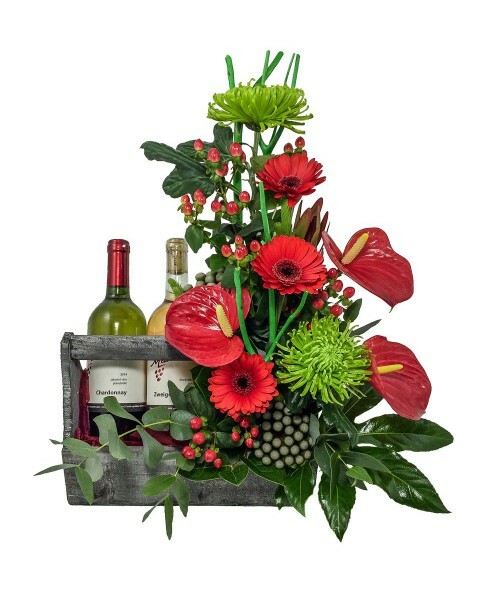 A beautiful representative arrangement with 2 bottles of wine. 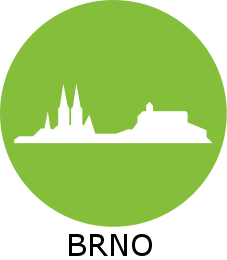 This box is available only in Brno, in other localities will be use a basket. 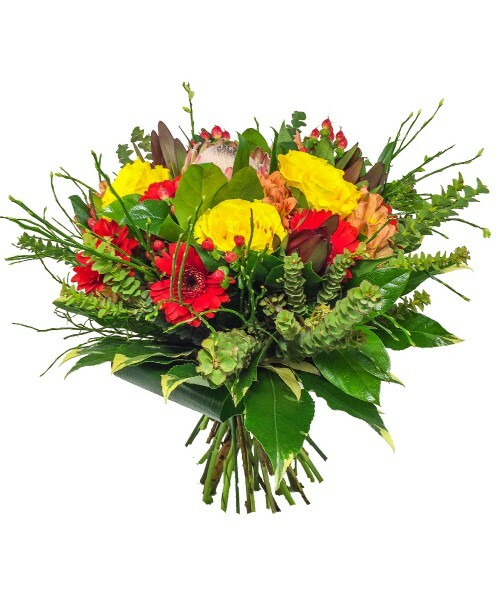 Do you want to make pleasure not only with flowers? So simply take advantage of this special offer. 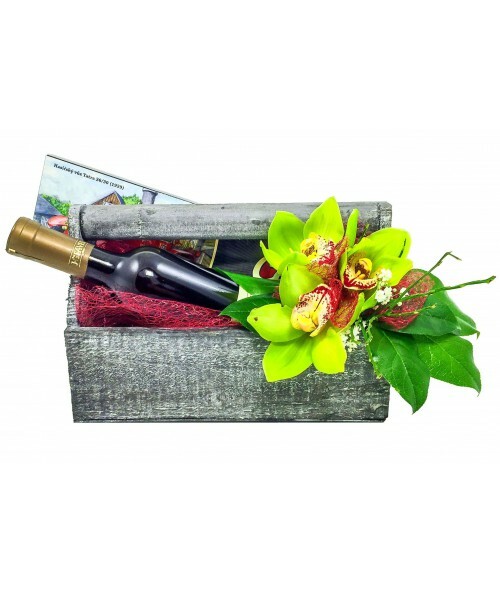 Practical wooden box with Moravian wine decorated with long lasting flowers. 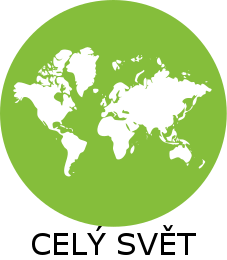 Order at least 2 working days in advance. 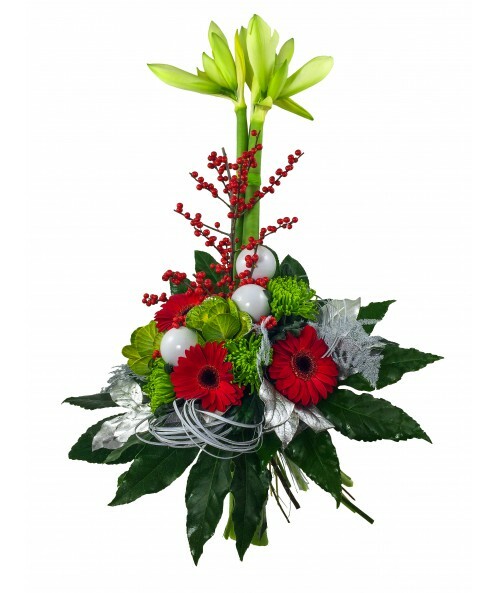 A bouquet of traditional Christmas colours - an elegant way to send your special greetings to your beloved. Noble liquer wine from company J. Stavek and a big chocolate decorated with seasonal flowers. 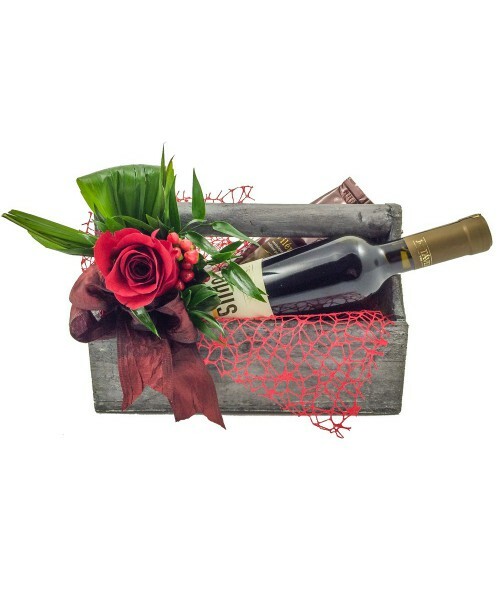 Cheer somebody up with this fine liquer wine and chocolates in a practical wooden box. Please order at least 2 working days in advance. 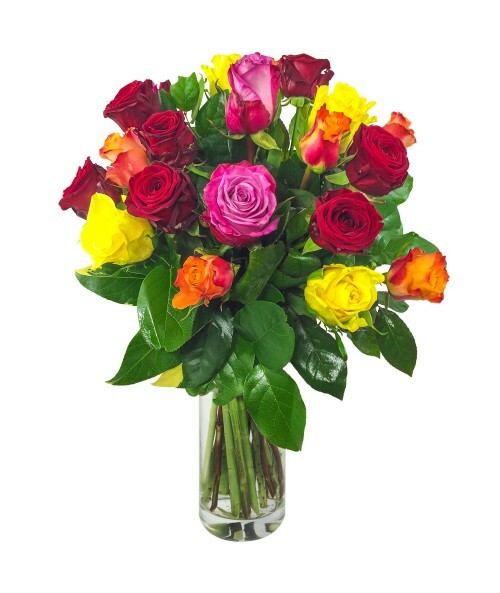 The bouquet can vary depending on the availability. 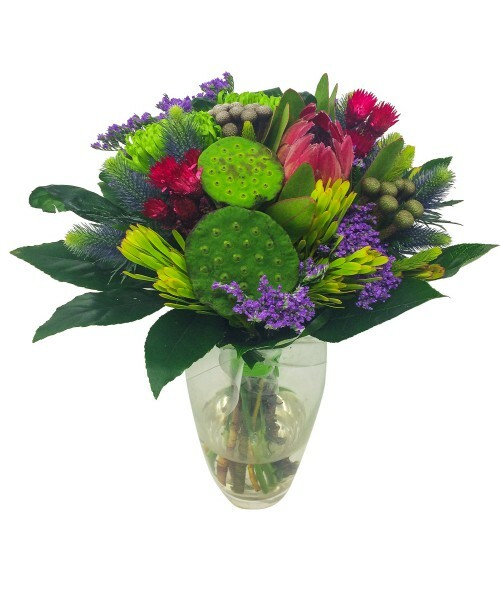 Do you want to send anything interesting, long-lasting and exotic together? This is a right choice for you. 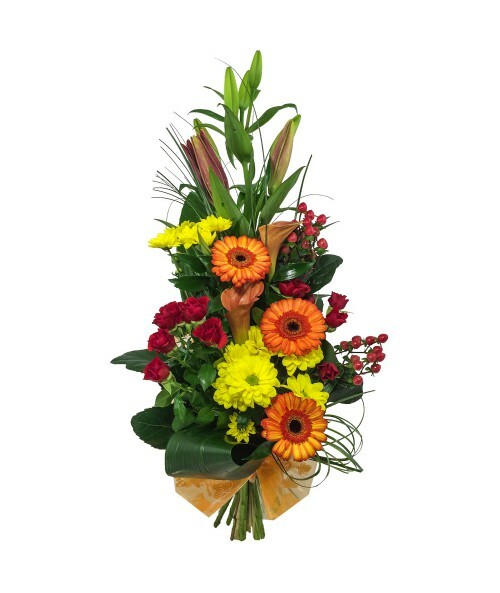 Deluxe elegant bouquet of seasonal flowers for special occasion. Suitable for both men and women. 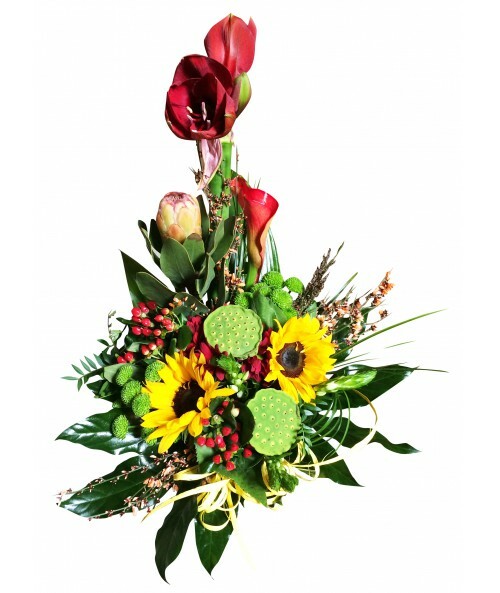 Kind of flowers can vary according to the season. Would you like to warm somebody`s heart? 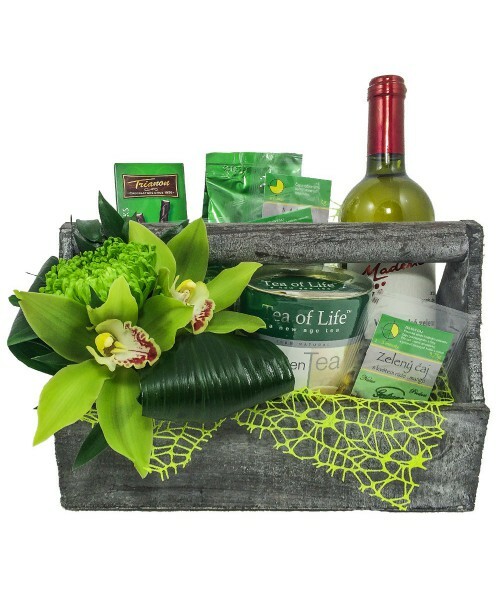 Give this basket full of flowers, tea and fruit. You will make double joy. The gift set contains: 1 bottle of wine, 250 g of the exclusive coffee Gaetano, tea (Gatuzo and Tea of life), chocolates and hearts. 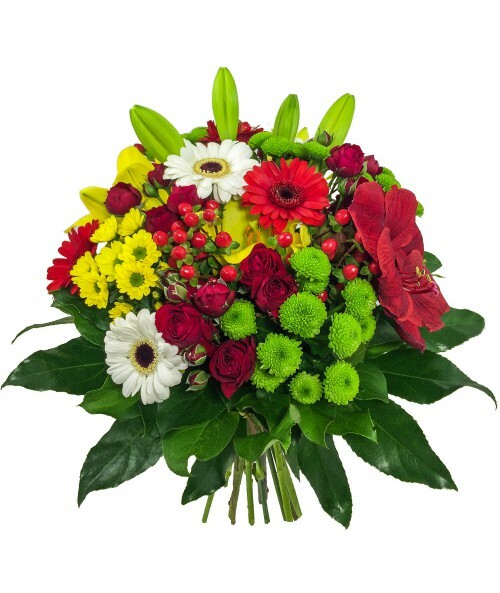 Do you want to say "Happy Birthday, Thank you or simply make someone happy? 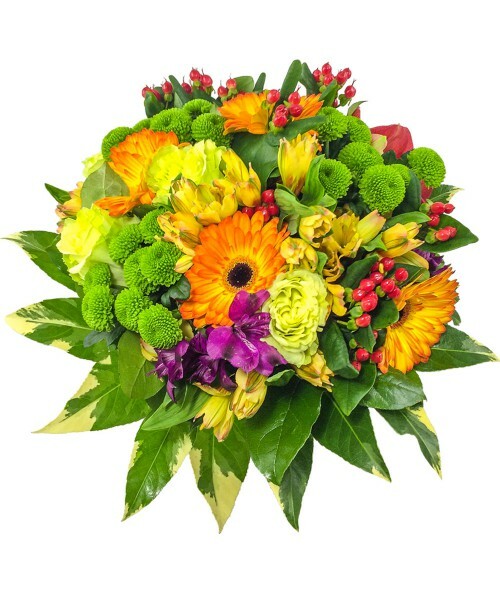 Do not hesistate because this multicoloured bouquet wil make the smile on the face to everyone. Are you not sure what present is aappropriate for a man? 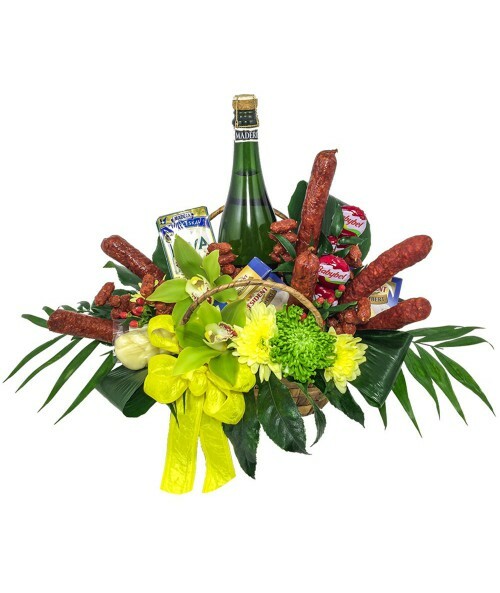 A good sparkling wine Louis, sausages and cheese in a nice seasonal decorated basket certainly makes happy every man and often a woman as well as. Do you want any long life flowers? 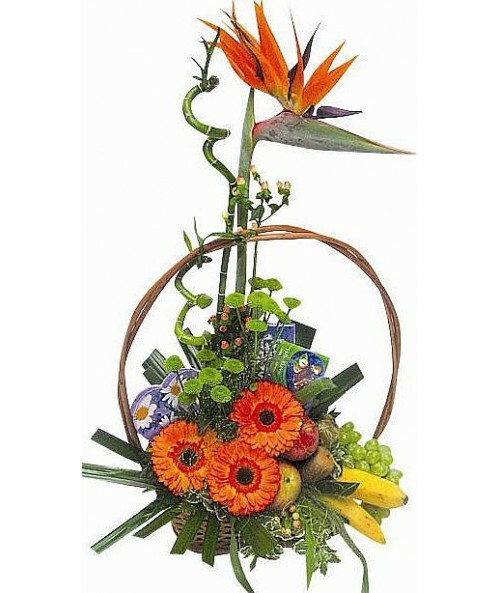 So, do not hesistate and order this nice basket full of exotic orchids. Add water everyday and long life is guaranteed. 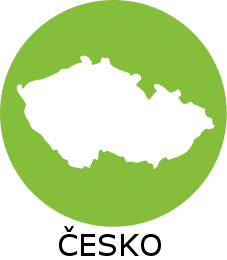 Rosé brut available only in Brno, it will be substituted in other localities. 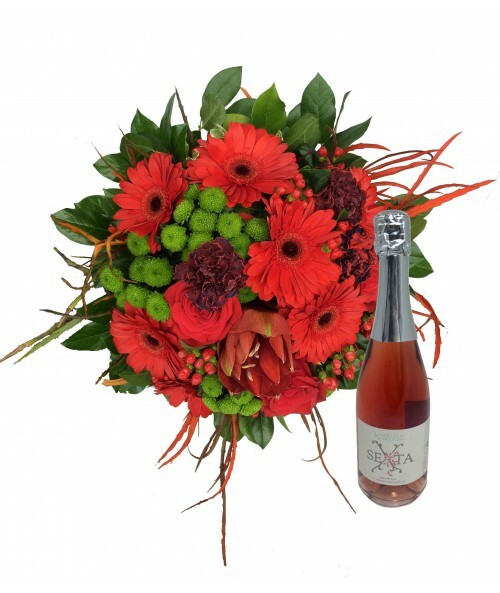 After hard working day let your beloved have a pleasant evening rest with this romantic bouquet and delicious champagne Rosé brut. They will appreciate it ! 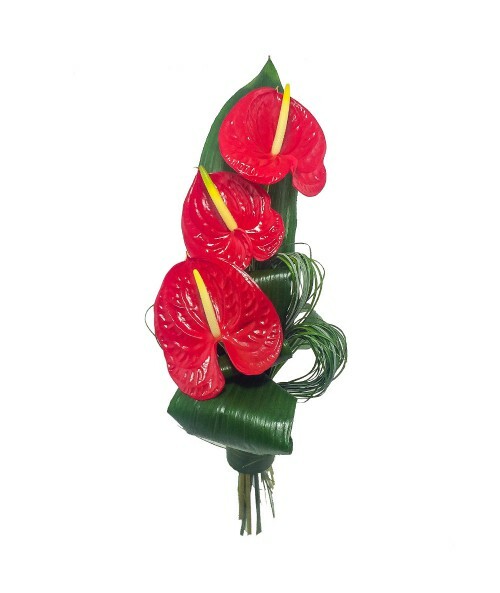 Colour of anthuriums can vary. 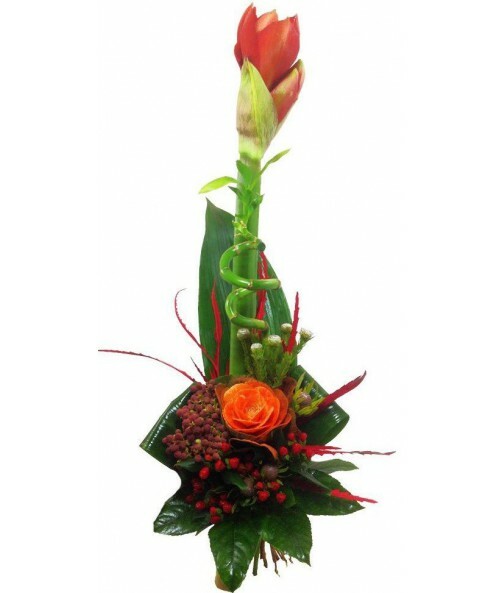 Colour of anthuriums can vary. 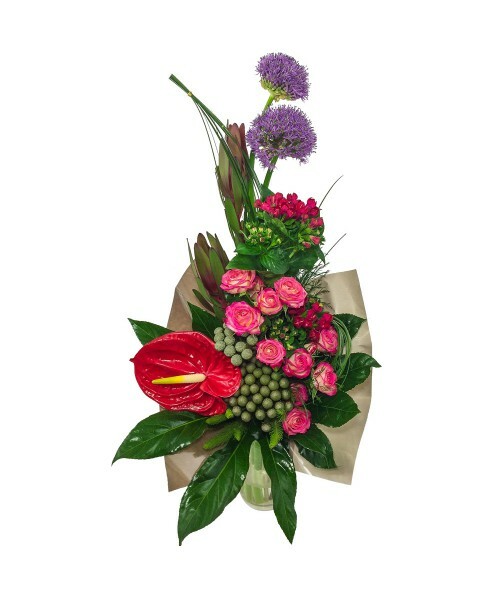 Extraordinary bouquet of 7 mixed coloured anthuriums. 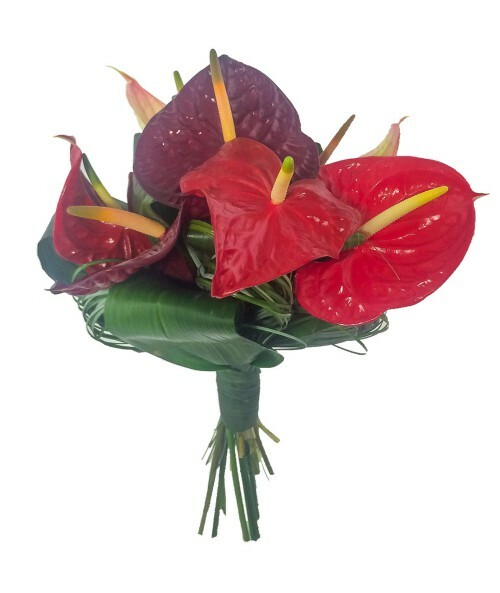 Colour of anthuriums can vary. 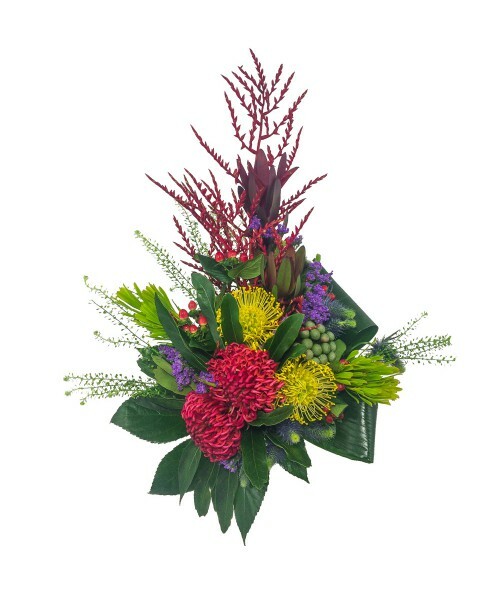 Interesting bouquet of roses, gerberas and exotic sesasonal flowers. Please order at least 2 working days in advance. 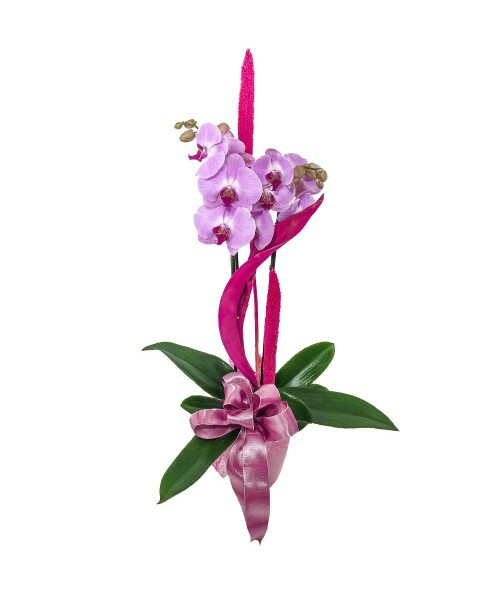 Strelitzie is not always available and it can be substituted by another exotic flower. Would you like to warm somebody`s heart? 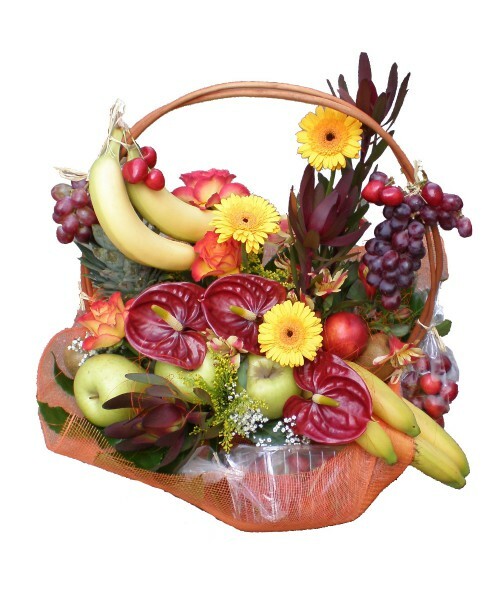 Give this basket full of flowers, sweets and fruit. It will make triple joy. Are you looking for some birthday or get well soon present? This gift basket is simply perfect. It contains fruit, vegetables, cheese, tea, chocolates and a good bottle of wine. Suitable for men and women as well as. 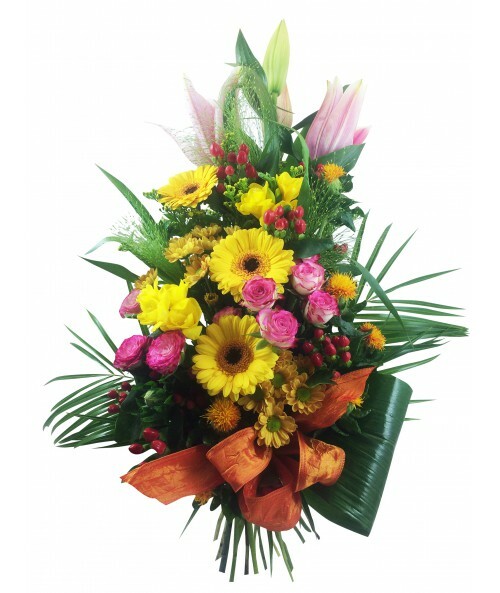 This lovely romantic bouquet will brighten face of your beloved. If some seasonal flowers are unavailable, they can be substituted. Do you want to say thank you or happy birthday? 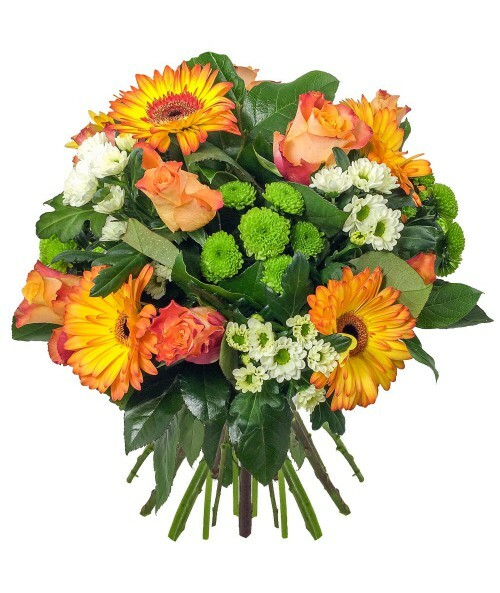 Send this beatiful bouquet and make someone happy today. 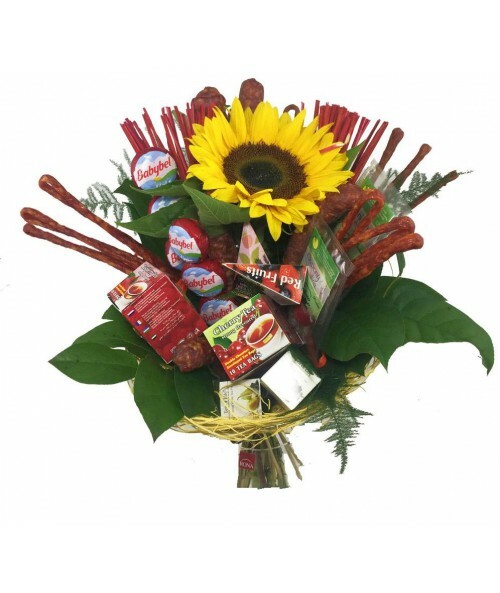 Men don´t usually like to get flowers but this our "Sausage and tea bouquet" is something else. Delicious sausages, cheese and good tea make them certainly happy. 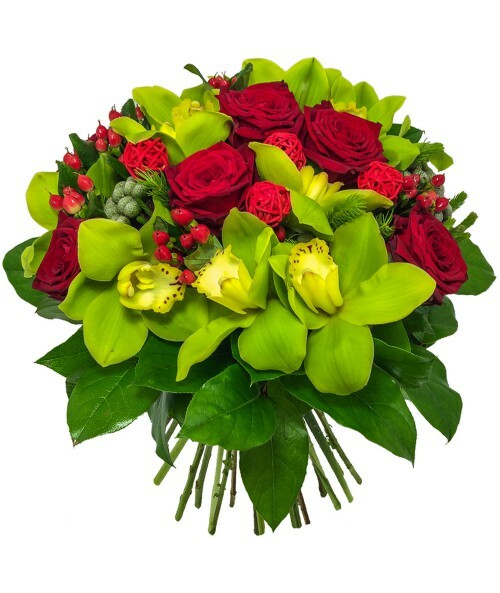 Interesting romantic bouquet of roses and orchids. 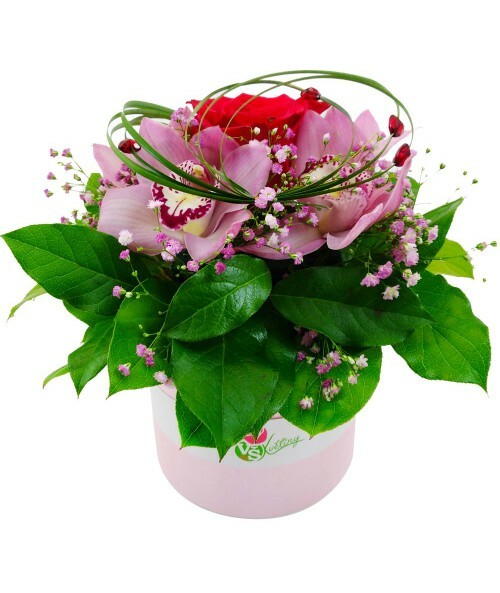 You must order it in advance because it is time consuming bouquet. 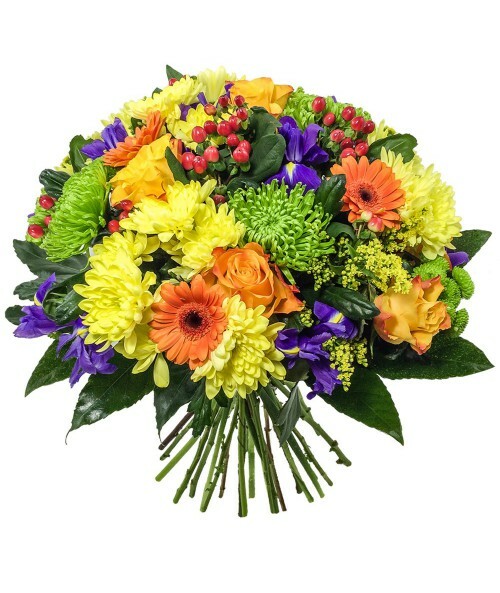 So you can be nearly sure that the recipient has not received this type of bouquet yet. Are you or your beloved going through the difficult time in personal life or at work? Do they need encourage? 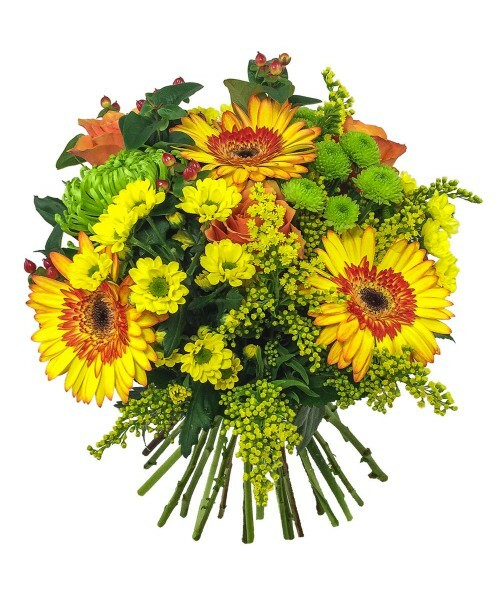 Send them warm sun in this beautiful sunshine bouquet. Sunshine for me, sunshine for you. 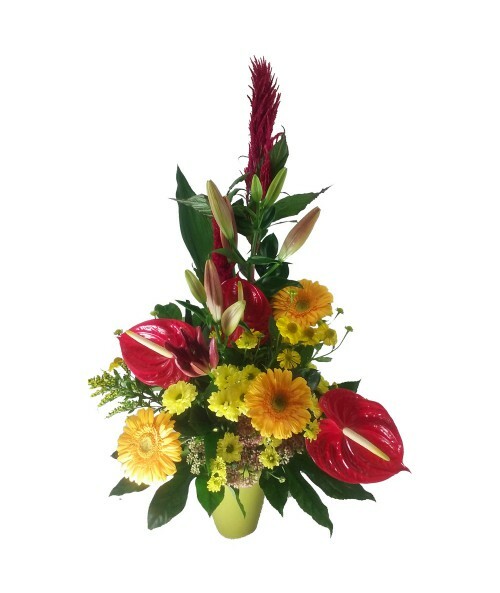 This bouquet is not ordinary one. 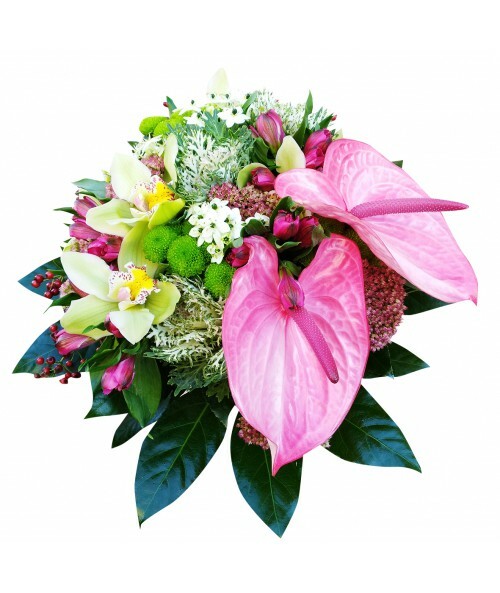 It is interesting combination of various flowers with dominating anthuriums. 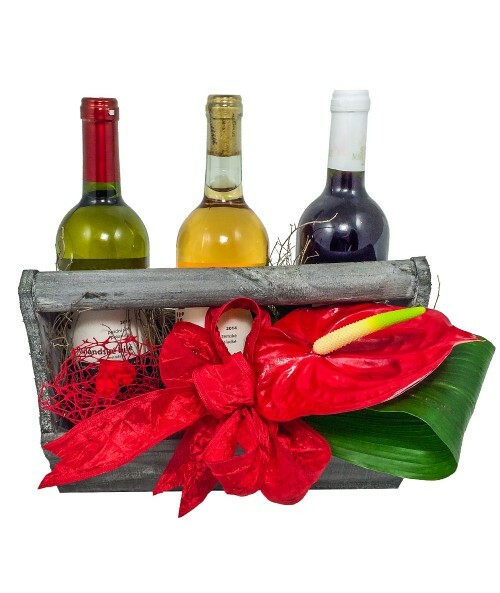 Git set of 3 wines - white, red and pink wine gift wrapped. Noble liquer wine from company J. Stavek, 250g of exclusive coffee Vilemova kava and floral decoration as in the picture. Lift their mood ! No matter if it is a man or a woman. They both will really appreciate the aroma of the excellent coffee from the family company and a noble liquer wine in a practical wooden box.